Media captionIs Brexit fraying British-Irish relations? But as the Republic of Ireland celebrates its parliament's centenary, experts have warned that British-Irish relations have been frayed by Brexit. 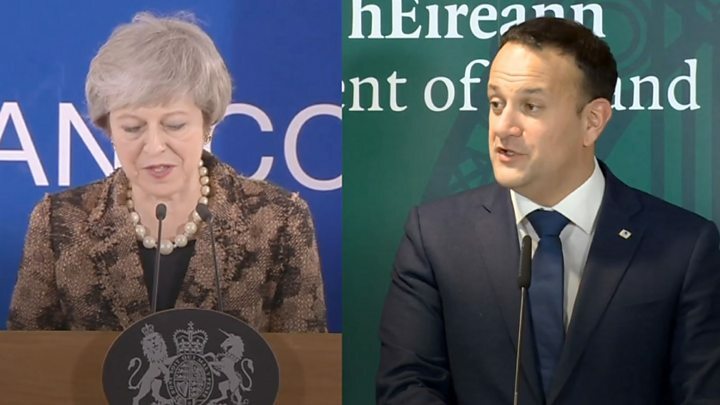 Dan O'Brien, the chief economist at Ireland's foreign affairs think tank the Institute of International and European Affairs, said that "as soon as the (EU) referendum happened, everything in the Dublin-London relationship was affected". "Work on the relationship goes far beyond repair," he added. "It involves a very substantial rebuilding and new building given the context of the relationship for decades has been joint EU membership." The first Dáil sitting was "dignified, solemn and it was about enunciating key messages and key priorities", according to historian Diarmaid Ferriter. "The response from Britain was pretty quiet as they didn't really know how to respond, except by insisting it wasn't going to recognise its legitimacy," he said. "Britain had its eyes on the much bigger picture of what the international order was going to be after the war." Indeed, 1919 was also the same year their plans for the partition for Ireland were drawn up. Having committed to self-government, or Home Rule, in Ireland, the British government faced opposition from Irish unionists, most of whom lived in the northeast of the island. The answer was to create two self-governing territories. "The year 1919 is really the beginning of the partition question, practical division of Ireland and almost 100 years later we are still dealing with its legacy," said Mr Ferriter. The 1921 Anglo-Irish Treaty established the Irish Free State, a dominion of the British Commonwealth. The treaty allowed Northern Ireland to opt out of the new state, creating divisions among republicans and a civil war in Ireland broke out. "The difficulty for Sinn Féin after partition was how they were going to play their hand and negotiate independence," said Mr Ferriter. Ireland became a fully independent state in 1937 but did not withdraw from the Commonwealth until 12 years later. Back in 1919 one of the most high profile politicians who participated in the first Dáil was Éamon de Valera. His grandson Eamon ó Cuív is a Fíanna Fáil TD in the 32nd Dáil. He is the only descendant of a first Dáil member to currently serve in the 100-year-old institution. While de Valera was opposed to the Dáil's oath of allegiance to the crown and used his seat and position as Irish prime minister to work towards an independent Ireland, Mr Ó Cuív said his grandfather always wanted a good relationship with Britain. "He had a good working relationship with Neville Chamberlain," he said. Mr Ó Cuív said there was "not an anti-British sentiment" in his grandfather, regardless of the view that is often portrayed. He added that while "he wouldn't have met the King or Queen" he happily met their close relative Lord Mountbatten in India in 1948. "He met him as an equal, as a representative of a free Ireland." But de Valera's relationship with Winston Churchill was not as cordial. One famous tête-à-tête between Churchill and de Valera played out publicly when, in his Victory in Europe Day speech broadcast to the world, Churchill was critical of the then taoiseach (Irish prime minister) and Ireland's policy of neutrality throughout the war. Three days later, de Valera, in a much anticipated reply, outlined Ireland's right as an independent state to remain neutral. "It is indeed hard for the strong to be just to the weak but acting justly always has its rewards," he wrote. In the years following their time in power, the perimeters of conversations between London and Dublin changed, said Mr Ferriter. "It becomes more about finding commonality - economics and joining the European Union. "What changes that is the outbreak of the Troubles in 1969. "It forced Dublin to look over the border for the first time since the 1920s and it hugely complicated the relationship - bringing it back to the question of: 'Whose responsibility is this? '," he said. For Etain Tannam, an associate professor of politics at Trinity College in Dublin, the effort that both the Irish and British governments put into forming the 1998 Good Friday peace agreement saw relations "reach their heyday". With the emergence of peace in Northern Ireland and austerity in the Irish Republic during the early 2000s, she believes there was "a period of backing off" between the governments. As Mr Ferriter puts it, Brexit and the issue of the backstop have forced the two sides to re-examine their relationship. "The Brexit vote was a reminder that there were legacy issues from 1920s that haven't been solved," he said. "The border had all but disappeared… but Brexit upended that approach." Dr Tannam believes the relationship between both governments has become one of "crisis management". "We've seen old stereotypes reoccurring," she said. "There hasn't been the same level of communication like during the 1990s." 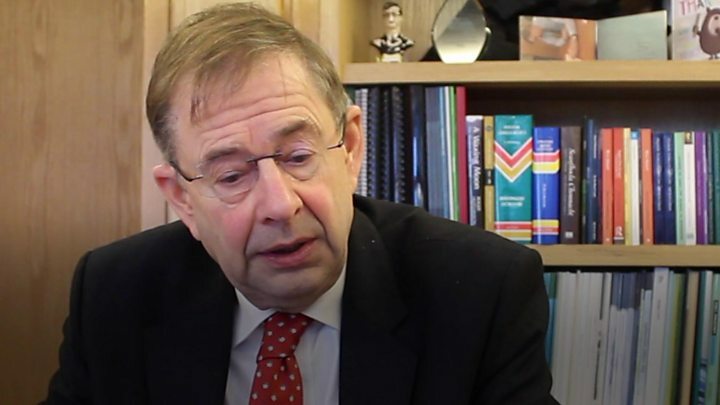 Economist Dan O'Brien said that during Brexit negotiations "there is no doubt that senior politicians have made statements that have aggravated the situation". Dr Tannam believes there has been an increase in communication, especially over the past 18 months. "I don't think it's that fragile right now but that's only because it was reined in." When it comes to the future, she said British-Irish relations will "stabilize once this uncertainty has ended".